FITTED TO THE JAGUAR XJ 2.8, 4.2 1969-75, E TYPE 4.2 1966-75, XK140 1954-57, XK150 1957-61, 240 1968-69. DAIMLER 420 1963-70, SOVEREIGN 2.8, 5.3 1969-86, COUPE 1973-77 & LIMOUSINE 1968-91 RANGE. PART NUMBER: 9709. & DAIMLER DART. DAIMLER V8. Daimler Consort. Replaces:~ Lucas 407044 DCB121C 407050 DSB122C 407030 DRB106C. IGNITION KIT. for use with Distributor 40175 - DZ6A. (stamped in Distributor body). It should not be altered / tampered with/used. POWERSPARK™ Standard 45D6 Distributor. Supplied with a high quality Standard non ballast ignition coil. This distributor is supplied with a Powerspark standard ignition coil to match the signature module custom built into the distributor. FITS JAGUAR V12 E-TYPE SERIES 3. 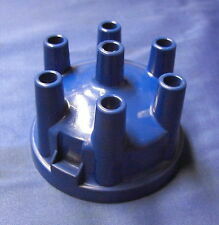 DISTRIBUTOR CAP. Replaces:~ Lucas 54411772, dsb110. Daimler 2.5 V8. Tip- clean anvil faces before use. This is a set of. (made to original specification). Check out the. It should not be altered / tampered with/used. PART NUMBER: 9711. & DAIMLER SP250 DART. DAIMLER V8. PART NUMBER: JLM9624. XJS V12 H.E. XJ12 SERIES 3 FROM VIN 310613. 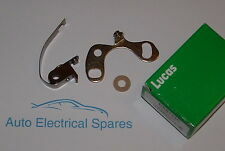 For use with Lucas Distributor 40175 - DZ6A. Daimler Consort. replaces: Lucas 407050, 488657, 491255, 194256, CS14. It should not be altered / tampered with/used. NOT included. 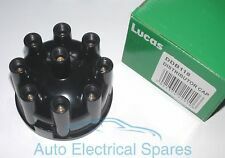 Replaces:- Lucas 418857, 54414989 Lucas DC15 Lucas DDB115. DAIMLER MAJESTIC. used on Lucas Distributor 40614A/B. 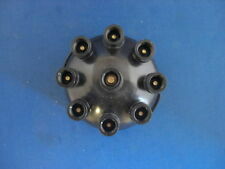 Distributor Cap. (number stamped on distributor body). Alloy Head. Top Quality. for Screw In HT Leads. PART NUMBER: RTC2641. XJ6 SERIES 3 4.2UPTO VI N 309115 (NOT AUSTRA LIA, CANADA, JAPAN OR USA). DISTRIBU TOR VACUUM & AMPLIFIER. Lucas dos puntos 403670 DU8 Allard/Daimler etc. Positive earth Electronic 45D6 Distributor. Complete 45D6 Positive earth electronic distributor. Suitable For: Positive earth Jaguar, Triumph & Austin Healey. Ignition Coil with more than 1.5 Ohms resistance. Replaces:~ Jaguar JLM263 ~Land Rover 262704 RTC4542 ~ Lucas 407030 408355 415088 418726 60410566 DRB106C DRB126 DRB128 RA6. Daimler Consort. for use with Lucas Distributor 40175 - DZ6A. Top Quality. 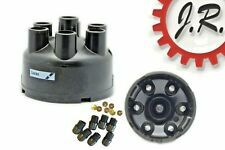 Powerspark Distributor cap. 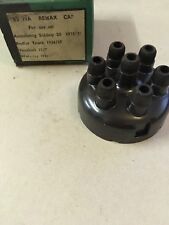 45D6 Top Entry Distributor Cap DDB113. Suitable For: Any vehicle fitted with the Lucas 45D6. for Lucas 45D6 distributors. For use with Lucas 45D6 distributor as fitted to. Replaces:~ Lucas 407044 DCB121C 407050 DSB122C 407030 DRB106C. Daimler Consort. IGNITION KIT. for use with Distributor 40175 - DZ6A. It should not be altered / tampered with/used. NOT included. PART NUMBER: RTC175. LOW TENSION LEAD & COVER. XJ6 SERIES 1. Fits Daimler DB18 Special Sports & 2.5 litre Empress. For use with Lucas Distributor 40676 A-K 20D8 Type BS Clockwise. DAIMLER 250 V8. Replaces:~ Lucas 54411935. It should not be altered / tampered with/used. NOT included. Conveniente para: Daimler SP250/Dart, 250 V8 y DR450 limusina. MPN L28Daimler 250 DR450 & IA_432665 . 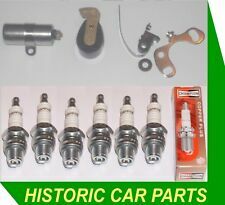 Manufacturer Part Number L28Daimler 250 DR450 & IA_432665 . Un conjunto de originales 8 cilindros Powerspark. Alvis, Daimler, Original En Caja Distribuidor Tapa, nos. Alvis TD21, 3 litre, 1959-1960. Daimler Conquest & Century, 1953-1958. Daimler One-O-Four, 1956-1959. Daimler DK400 Limousine, 1959-1960. Daimler Majestic, 3.8 litre, 1958-1963. Daimler Limousine, 4.5 litre, 1961. Daimler Jaguar Sovereign. Replaces:- Bosch Australia GL212, Chrysler 5043710, Delco CD1108, Delco 1138, Ford 5003334, Ford A770X12276AA, Land Rover 605544, Lucas 54417212, Lucas DC16, Lucas DC17, Lucas DDB117, Motorcraft EDH107, Scobro 4514. 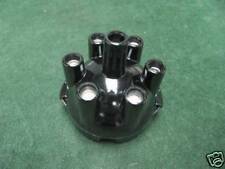 For use with Lucas Distributor 40676 A-K 20D8 Type BS Clockwise. Daimler 2.5 V8. Replaces:~ Lucas 54411772, dsb110. This is a set of. NOT included. MINI DAIMLER ROVER MG LOTUS JAGUAR MORRIS IGNITION CONDENSOR. DAIMLER 2.8 - 5.3 Sovereign 3.4. DAIMLER 2.8 - 5.3 Sovereign 4.2. DAIMLER LIMOUSINE 4.2. AUSTIN MAXI 1750 HL. AUSTIN MAXI II 1750. AUSTIN MAXI II 1750 HLS. 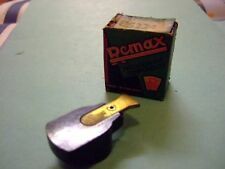 (for use with Lucas Distributor 41913). 4.2litre, 4235cc. Daimler Limousine. NOT included. Tapa del distribuidor Lucas DDB153. Lucas 54427897. Part Manufacturer Number DDB153. Daimler doble seis 1973-79. Daimler doble seis,vanden plas 1980-81. Autorizado Distribuidor Reino Unido de Lucas Piezas eléctricas. Replaces:~ Lucas 407044. Daimler 2½ l itre. for use with Lucas distributor numbers. (number stamped on the distributor body). It should not be altered / tampered with/used. Check out the. Lucas 25D6 Distributor. Lucas 22D6 Distributor. Suitable For: Vehicles fitted with a Lucas D22D6 or D25D6 with Screw-in HT Leads. So if you do have any problems you know we’ll sort it.